This week, with a number of military anniversaries being celebrated all around the world, not least the start of the First World War, it seemed the perfect time to look Neutral Bay. There are many places in and around Sydney which have played a role during times of war and in the defence of the city, but Neutral Bay is rather special being, as the name suggests, an historic neutral harbour. Neutral Bay was named and given a function very early in the history of European settlement in Australia. Just a year after the fleet first arrived, in 1789 Governor Phillip decreed the bay was to be the place of anchor for all non British, ‘neutral’ ships visiting Port Jackson. He called the area Neutral Bay. The ships which anchored in the area could use a small, unnamed creek to replenish their stores of fresh water, though they had to pay for the privilege throughout the 19th century. Neutral Bay was chosen as the site for foreign vessels to rest because it was seen as far enough from Sydney Cove itself to discourage convicts from attempting to escape and make their way home on a foreign ship. In addition, it kept any enemy ships at a safe distance from the settlement itself. 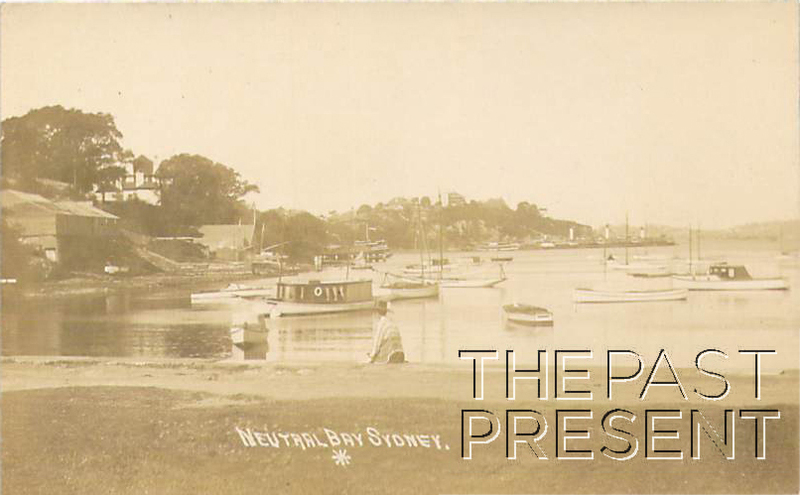 There are a number of images of Neutral Bay in the Past Present collection, so check back to see more at a future time! This entry was posted in New South Wales, Sydney Suburbs and tagged 1910s, government, industry, military, postcard collection, sydney, sydney harbour.